Background and Objectives: EUS-guided biliary drainage (EUS-BD) is increasingly reported as a salvage technique after failed endoscopic retrograde cholangiopancreatography, but it is still controversial whether EUS-BD can replace transpapillary biliary stenting. Therefore, we conducted this multicenter, prospective study of EUS-guided choledochoduodenostomy (EUS-CDS) using a covered metallic stent (CMS) as primary biliary drainage for unresectable distal malignant biliary obstruction (MBO). Methods: Patients with unresectable distal MBO without any prior drainage are enrolled. Primary endpoint is a technical success and secondary endpoints are adverse events, functional success, and recurrent biliary obstruction (RBO) of EUS-CDS. Clinical outcomes were compared between EUS-CDS and transpapillary stenting as a control. Results: A total of 34 patients were enrolled in 10 Japanese institutions. The cause of MBO was pancreatic cancer in 28 patients. Median tumor size and common bile duct diameter were 31 and 13 mm, respectively. Technical success rate was 97% with a median procedure time of 25 min and functional success rate was 100%. The rate of RBO was 29% and the causes of RBO were nontumor related: Migration in 18%, sludge/food impaction in 9%, and stent impaction to the duodenal wall in 3%. Other adverse events were abdominal pain in 6% and cholecystitis in 9%. A median cumulative time to RBO was 11.3 months. The rate of RBO and cumulative time to RBO of EUS-CDS were comparable to those of transpapillary stenting (36% and 9.1 months, respectively). Conclusion: EUS-CDS using a CMS as primary biliary drainage was technically feasible and its safety appeared comparable to transpapillary stenting. EUS-guided biliary drainage (EUS-BD) has been increasingly reported as an alternative to percutaneous transhepatic biliary drainage (PTBD) in cases with failed ERCP for malignant biliary obstruction (MBO)., Although its technical success rate was reportedly high, EUS-BD can be complicated by adverse events such as bile leak., Our previous multicenter retrospective study of EUS-BD showed the efficacy of EUS-BD for MBO and the use of covered metallic stent (CMS) was associated with less adverse events including bile leak compared with a plastic stent. In comparison to transpapillary biliary drainage by ERCP, EUS-BD can theoretically avoid post-ERCP pancreatitis (PEP) and provide longer stent patency by bypassing the ampulla and the biliary stricture by the tumor. Because of these potential advantages, EUS-BD can be an alternative primary biliary drainage for MBO. However, only a few prospective studies in a single center have been reported so far to evaluate its role as primary biliary drainage., This is a multicenter, prospective study to evaluate EUS-guided choledochoduodenostomy (EUS-CDS) as primary biliary drainage for unresectable distal MBO. This is a multicenter, prospective, single-arm study in ten Japanese centers. A median number of experiences of EUS-BD at each center were 20 (range, 4–300). All participants underwent EUS-CDS using a CMS for unresectable distal MBO. Institutional review boards at each site approved the study protocol and all patients gave written informed consent after detailed discussion. The study was registered on the UMIN Clinical Trials Registry (UMIN-CTR: 000009736). The inclusion criteria were patients with unresectable distal MBO without prior biliary drainage, age ≥20 years old, performance status 0–2, and serum total bilirubin ≥2.0 mg/dL. Exclusion criteria are the presence of massive ascites, altered gastrointestinal anatomy, hilar biliary obstruction (<2 cm from hilum), poor visualization of the bile duct on EUS, severe coagulopathy, and severe comorbidity. All EUS procedures were performed under moderate sedation. Prophylactic antibiotics were routinely administered before EUS-CDS procedure. After EUS scope insertion, common bile duct (CBD) was visualized from the duodenal bulb and was punctured by a 19-G FNA needle. After aspiration of the bile, the contrast was injected into the bile duct, followed by a 0.025-inch guidewire insertion to the intrahepatic bile duct. Dilation of duodeno-choledocho fistula was performed using a coaxial electric cautery, bougie, and/or balloon dilator at the discretion of the endoscopist. Finally, a CMS (WallFlex Biliary RX Covered Stent; Boston Scientific Japan, Tokyo, Japan) was inserted over the guidewire and placed across the duodeno-choledocho fistula. Computed tomography (CT) scan and abdominal X-ray were performed to evaluate adequate biliary drainage as well as adverse events such as stent migration, perforation, and bile peritonitis. The primary outcome is a technical success. Secondary endpoints are adverse events, functional success, and recurrent biliary obstruction (RBO). Overall survival and a cumulative time to RBO were calculated using a Kaplan–Meier method. Procedure time was defined as time from scope insertion to scope removal after completion of EUS-CDS. Technical success is defined as CMS insertion in an appropriate position and functional success is defined as resolution of jaundice. Adverse events were graded according to the severity grading system of the American Society for Gastrointestinal Endoscopy lexicon. Bile peritonitis was diagnosed when postprocedure CT revealed the presence of fluid around CDS, accompanied with clinical symptoms of peritonitis. To evaluate the feasibility of EUS-CDS as primary biliary drainage, procedure-related adverse events, defined as adverse events within 48-h of EUS-CDS procedure, were separately analyzed in addition to technical and functional success. Other adverse events were classified as early (<30 days) and late (≥30 days). No sample size calculation was performed since this was a pilot study. Data on transpapillary placement of a covered WallFlex stent for distal MBO were retrospectively extracted as a control group. Consecutive patients with unresectable distal MBO who underwent a covered WallFlex stent placement as an initial biliary drainage in the University of Tokyo Hospital between December 2009 and October 2014 were included in the analysis. Procedure time, the rate of RBO and other adverse events, and Time to recurrent biliary obstruction (TRBO) were compared between EUS-CDS and transpapillary stenting. Clinical outcomes were compared using the Mann–Whitney U-test (procedure time), Fisher's exact test (RBO and adverse event rates) or the log-rank test (TRBO), and a two-sided P < 0.05 was considered to be statistically significant. 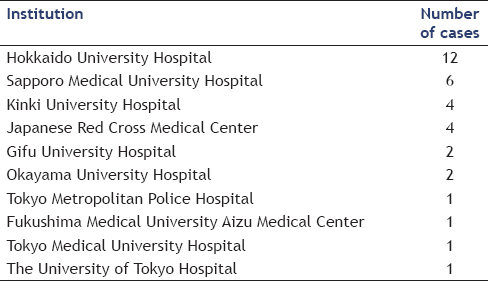 Between February 2013 and May 2014, a total of 34 patients were enrolled in 10 Japanese centers [Table 1]. During the study period, a median number of initial biliary drainage for distal MBO was 30 (range, 20–350) at each institution. Patients' characteristics are shown in [Table 2]. The cause of MBO was pancreatic cancer in 28 patients (82%). The size of CBD was 13 mm in median. Duodenum was involved by tumor in 14 patients. Duodenal involvement was proximal to the ampulla in 8, around the ampulla in 1 and distal to the ampulla in 5. 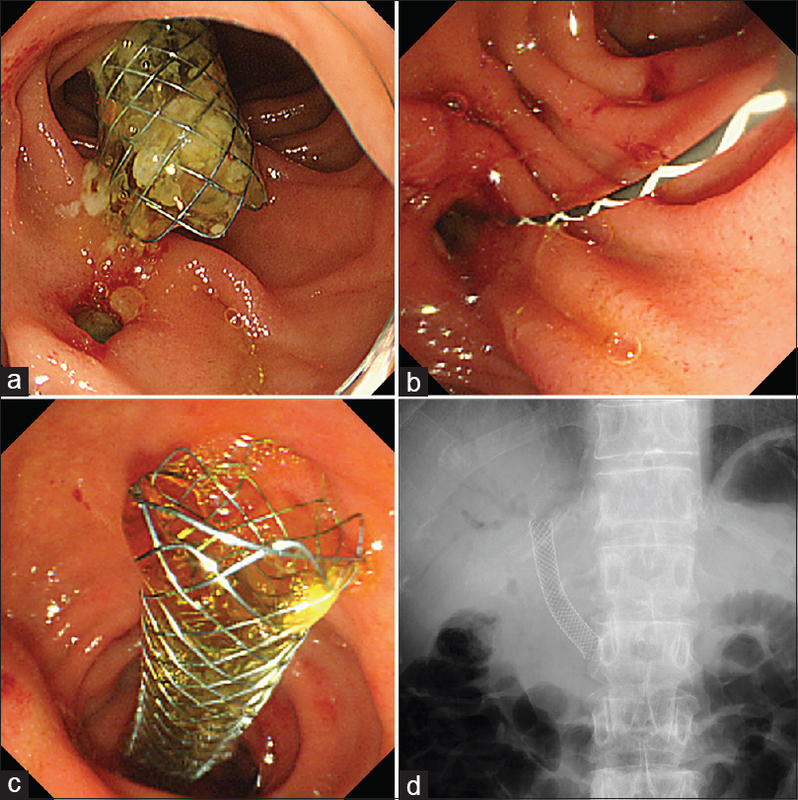 Duodenal stent was placed in seven patients (21%), before EUS-CDS procedure in 5 patients, simultaneous to EUS-CDS procedure in one patient, and after EUS-CDS procedure in one patient. A median follow-up time of the study cohort was 5.8 months with one patient lost to follow-up after 8 days of the procedure. Ten patients were alive at the last follow-up after a median of 7.3 months. Median cumulative survival time after EUS-CDS procedure was 8.2 (95% confidence interval [CI], 3.3–10.5) months. Median procedure time was 25 (range, 8–60) min. EUS-guided puncture of the bile duct, cholangiogram, and guidewire insertion was successful in all cases. Stent delivery system could not be inserted into the bile duct even after fistula dilation in one patient and a 7-Fr plastic stent was placed as EUS-CDS instead of a CMS. A CMS was successfully placed in the other 33 patients, resulting in a technical success rate of 97%. The stent diameter was 10 mm in 31 and 8 mm in 2, and the stent length was 6- cm in 30, 8cm in 2, and 4 cm in 1. A full-covered and a partially-covered WallFlex stent was placed in 21 and 12 cases, respectively. Functional success rate was 100% (34/34). RBO and adverse events are shown in [Table 3]. The RBO rate was 29% (10/34). The causes of RBO were stent migration in 6, sludge/food impaction in 3, and stent impaction to the duodenal wall in 1, and no tumor-related biliary obstruction was observed. A median time to stent migration was 87 (range, 11–229) days and all stent migration was distal migration, which was treated by stent-in-stent (n = 2) or stent exchange (n = 3) through EUS-CDS fistula [Figure 1], or by conversion to transpapillary stenting (n = 1). Stent migration rate of a fully-covered stent (19%) was higher than that of a partially-covered stent (8%), but the difference was not statistically significant (P = 0.63). A median time to RBO by sludge or food impaction was 271 (range, 1–343) days. Reintervention for stent impaction was stent repositioning (n = 1) and those for RBO by sludge/food impaction were stent exchange (n = 1) and stent-in-stent (n = 2). In another patient with new-onset duodenal obstruction distal to the ampulla, ascending cholangitis developed but resolved by duodenal stent placement alone. Overall, median cumulative time to RBO was 11.3 (95% CI 7.4-NA) months [Figure 2]. The overall adverse event rate was 15% (5/34): 2 mild abdominal pain and 3 moderate cholecystitis. Abdominal pain resolved with conservative treatment, but percutaneous transhepatic gallbladder drainage was needed in three patients with cholecystitis. Neither bile peritonitis nor pancreatitis was observed. Among these adverse events and RBO, procedure-related adverse events (within 48 h of EUS-CDS procedure) were observed in four patients (12%): Two abdominal pain, one cholangitis, and one cholecystitis. The remaining adverse events were one early cholecystitis and one late cholecystitis. Data on 25 patients who underwent transpapillary biliary drainage using a covered WallFlex (14 fully covered and 11 partially covered) were extracted as a control group (Transpapillary group). 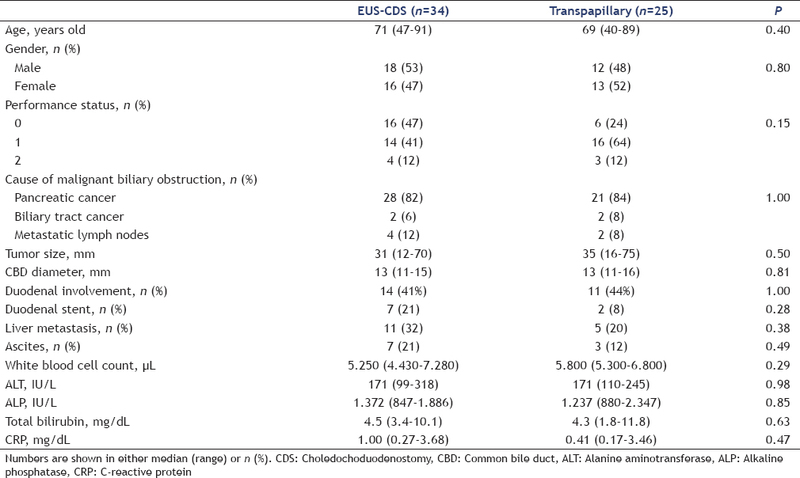 Patient characteristics were comparable between EUS-CDS and transpapillary groups [Table 2]. The rates of RBO were 29% and 36% (P = 0.78) in EUS-CDS and transpapillary groups, respectively [Table 3]. Kaplan–Meier curves of cumulative time to RBO are shown in [Figure 2]. A median cumulative time to RBO was 11.3 (95% CI 7.4-NA) and 9.1 (95% CI, 4.2–14.3) months (P = 0.96). Four cholecystitis, one PEP, and one liver abscess developed after transpapillary stenting, and the adverse event rate was 24% in transpapillary group, compared with 15% in EUS-CDS (P = 0.50). Meanwhile, a median procedure time was 52 (range, 25–155) min, which was significantly longer than 25 min in EUS-CDS group (P < 0.01). This prospective multicenter study evaluated the clinical outcomes of EUS-CDS performed at 10 Japanese centers. In our study, EUS-CDS using a CMS was technically feasible as primary biliary drainage for unresectable distal MBO. Both technical (97%) and functional (100%) success rates were high and the rate of procedure-related adverse events (12%) appeared comparable to that of transpapillary biliary stenting. In addition, EUS-CDS can potentially reduce postprocedure pancreatitis by avoiding biliary access through the ampulla. Since EUS-CDS was first reported by Giovannini in 2001 as “EUS-guided bilioduodenal anastomosis,” EUS-BD has been increasingly reported as an alternative to failed ERC. Although safety and efficacy of EUS-BD were reportedly comparable to or even better than PTBD, or transpapillary stenting,, EUS-BD as primary biliary drainage has been limitedly reported. Hara et al. reported a high technical success rate and acceptable adverse event rate in two prospective single-center studies of EUS-CDS as primary biliary drainage for distal MBO, using a plastic stent or CMS. However, there has been no multicenter prospective study of EUS-BD in this setting so far. Technical feasibility and safety should be the priority to establish the role of EUS-CDS as primary biliary drainage. Our study demonstrated high technical and functional success rate with acceptable procedure-related adverse events (12%). A failed or difficult endoscopic retrograde cholangiography (ERC) can be encountered even by an expert, especially in cases with tumor invasion to the duodenum or with an indwelling duodenal stent. In addition, long-term outcomes of transpapillary stenting are poor in these cases as previously reported., Our results of high technical success rate and short procedure time replicated the results shown in a multicenter retrospective study, and thus, EUS-CDS can be a good alternative to transpapillary stenting. In terms of safety, the absence of two adverse events should be emphasized: Postprocedure pancreatitis and bile peritonitis. Post-ERCP pancreatitis is still one of the most dreadful adverse events after ERCP. Although the risk of PEP is reported to be low after transpapillary stenting for pancreatic cancer, endoscopic sphincterotomy before transpapillary stenting cannot prevent PEP., In EUS-CDS, the stent does not overlap the orifice of the pancreatic duct, and theoretically, there is no risk of procedure-related pancreatitis, which was confirmed in our study. Meanwhile, EUS-guided puncture of the biliary tract has a risk of bile leak and subsequent bile peritonitis. The use of a CMS, rather than a plastic stent, can potentially reduce the risk of bile peritonitis.,,, In our study population, no overt bile peritonitis was observed using a CMS, but self-subsided abdominal pain seen in two patients might be due to temporary bile leak and bile peritonitis. Bile leak in these patients appeared minimal, if any, because these patients did not need any further interventions. Finally, while tumor involvement to the orifice of cystic duct is considered a risk of cholecystitis after transpapillary stenting,, the rate of cholecystitis in EUS-CDS was comparable to that in transpapillary stenting. Since CMS in EUS-CDS is unlikely to overlap the orifice of cystic duct involved by the tumor, the exact cause of cholecystitis after EUS-CDS should be further investigated. RBO was caused by either stent migration, sludge/food impaction, or stent impaction to the duodenal wall. Different from transpapillary stent placement traversing malignant biliary stricture, EUS-CDS is a bilioduodenal fistula and does not traverse biliary stricture. Therefore, no tumor-related RBO, that is, tumor ingrowth was observed. Stent migration is the major cause of RBO in EUS-CDS. Since there is no stricture where EUS-CDS is placed, stent migration did occur with a partially covered CMS, though its rate appeared low compared to a fully covered one. A CMS with antimigrating flaps can prevent stent migration in EUS-BD. Cholangitis due to food impaction or sludge was the other cause of RBO. Duodenobiliary reflux in patients with periampullary stricture is inevitable in transpapillary stenting and EUS-CDS alike. In one patient with duodenal stricture distal to the ampulla, duodenal stent placement alone can effectively prevent cholangitis, but conversion from EUS-CDS to EUS-guided hepaticogastrostomy (EUS-HGS) was necessary in the other case due to the worsening duodenal bulb stricture. In combined MBO and duodenal obstruction, double stenting of EUS-CDS and duodenal stent placement can be effective,,, but EUS-CDS can be still prone to duodenobiliary reflux. 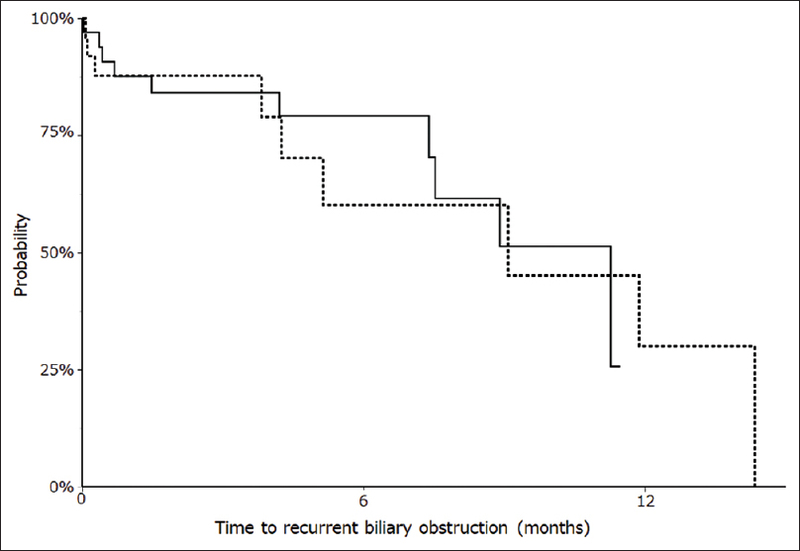 Biliary drainage away from duodenal obstruction might prevent cholangitis due to duodenobiliary reflux and Ogura et al. reported EUS-HGS showed better stent patency than EUS-CDS in patients with an indwelling duodenal stent. In the future, EUS-guided gastrojejunostomy can also be a treatment option, and the best approach to combined MBO and duodenal obstruction should be further clarified. There are some limitations in this study. This was not a randomized controlled trial. Although clinical outcomes were compared with a control group of transpapillary stenting, the number of cases was too small to draw a solid conclusion. The tubular CMS used in this study was originally developed for transpapillary stenting, but a lumen-apposing CMS dedicated for EUS-guided drainage is now commercially available. This lumen-apposing CMS can potentially reduce the risk of bile leak as well as technical failure. In addition, all the participating institutions are experts for interventional EUS, and it is still unclear whether our results can be generalized into the clinical practice or not. Finally, differences in stent size (10 mm vs. 8 mm) or stent type (fully covered vs. partially covered) might affect clinical outcomes in our study. However, we could not fully evaluate their effects due to a small sample size. Despite the limitations, this is a first multicenter prospective study of EUS-CDS as primary biliary drainage, and our promising results should encourage further prospective studies. EUS-CDS using a CMS as primary biliary drainage was technically feasible and its safety appeared comparable to transpapillary stenting. A randomized controlled trial of EUS-CDS and transpapillary stenting is warranted. Artifon EL, Aparicio D, Paione JB, et al. Biliary drainage in patients with unresectable, malignant obstruction where ERCP fails: Endoscopic ultrasonography-guided choledochoduodenostomy versus percutaneous drainage. J Clin Gastroenterol 2012;46:768-74. Khashab MA, Valeshabad AK, Afghani E, et al. A comparative evaluation of EUS-guided biliary drainage and percutaneous drainage in patients with distal malignant biliary obstruction and failed ERCP. Dig Dis Sci 2015;60:557-65. Dhir V, Artifon EL, Gupta K, et al. Multicenter study on endoscopic ultrasound-guided expandable biliary metal stent placement: Choice of access route, direction of stent insertion, and drainage route. Dig Endosc 2014;26:430-5. Kawakubo K, Isayama H, Kato H, et al. Multicenter retrospective study of endoscopic ultrasound-guided biliary drainage for malignant biliary obstruction in Japan. J Hepatobiliary Pancreat Sci 2014;21:328-34. Hara K, Yamao K, Niwa Y, et al. Prospective clinical study of EUS-guided choledochoduodenostomy for malignant lower biliary tract obstruction. Am J Gastroenterol 2011;106:1239-45. Hara K, Yamao K, Hijioka S, et al. Prospective clinical study of endoscopic ultrasound-guided choledochoduodenostomy with direct metallic stent placement using a forward-viewing echoendoscope. Endoscopy 2013;45:392-6. Cotton PB, Eisen GM, Aabakken L, et al. A lexicon for endoscopic adverse events: Report of an ASGE workshop. Gastrointest Endosc 2010;71:446-54. Giovannini M, Moutardier V, Pesenti C, et al. Endoscopic ultrasound-guided bilioduodenal anastomosis: A new technique for biliary drainage. Endoscopy 2001;33:898-900. Dhir V, Itoi T, Khashab MA, et al. Multicenter comparative evaluation of endoscopic placement of expandable metal stents for malignant distal common bile duct obstruction by ERCP or EUS-guided approach. Gastrointest Endosc 2015;81:913-23. Kawakubo K, Kawakami H, Kuwatani M, et al. Endoscopic ultrasound-guided choledochoduodenostomy vs. transpapillary stenting for distal biliary obstruction. Endoscopy 2016;48:164-9. Khashab MA, Valeshabad AK, Leung W, et al. Multicenter experience with performance of ERCP in patients with an indwelling duodenal stent. Endoscopy 2014;46:252-5. Hamada T, Nakai Y, Isayama H, et al. Duodenal metal stent placement is a risk factor for biliary metal stent dysfunction: An analysis using a time-dependent covariate. Surg Endosc 2013;27:1243-8. Hamada T, Isayama H, Nakai Y, et al. Transmural biliary drainage can be an alternative to transpapillary drainage in patients with an indwelling duodenal stent. Dig Dis Sci 2014;59:1931-8. Kawakubo K, Isayama H, Nakai Y, et al. Risk factors for pancreatitis following transpapillary self-expandable metal stent placement. Surg Endosc 2012;26:771-6. Hayashi T, Kawakami H, Osanai M, et al. No benefit of endoscopic sphincterotomy before biliary placement of self-expandable metal stents for unresectable pancreatic cancer. Clin Gastroenterol Hepatol 2015;13:1151-800. Sofi AA, Nawras A, Alaradi OH, et al. Does endoscopic sphincterotomy reduce the risk of post-endoscopic retrograde cholangiopancreatography pancreatitis after biliary stenting? A systematic review and meta-analysis. Dig Endosc 2016;28:394-404. Park DH, Koo JE, Oh J, et al. EUS-guided biliary drainage with one-step placement of a fully covered metal stent for malignant biliary obstruction: A prospective feasibility study. Am J Gastroenterol 2009;104:2168-74. Isayama H, Kawabe T, Nakai Y, et al. Cholecystitis after metallic stent placement in patients with malignant distal biliary obstruction. Clin Gastroenterol Hepatol 2006;4:1148-53. Suk KT, Kim HS, Kim JW, et al. Risk factors for cholecystitis after metal stent placement in malignant biliary obstruction. Gastrointest Endosc 2006;64:522-9. Song TJ, Lee SS, Park DH, et al. Preliminary report on a new hybrid metal stent for EUS-guided biliary drainage (with videos). Gastrointest Endosc 2014;80:707-11. Misra SP, Dwivedi M. Reflux of duodenal contents and cholangitis in patients undergoing self-expanding metal stent placement. Gastrointest Endosc 2009;70:317-21. Itoi T, Itokawa F, Tsuchiya T, et al. Endoscopic ultrasound-guided choledochoantrostomy as an alternative extrahepatic bile duct drainage method in pancreatic cancer with duodenal invasion. Dig Endosc 2013;25 Suppl 2:142-5. Ogura T, Chiba Y, Masuda D, et al. Comparison of the clinical impact of endoscopic ultrasound-guided choledochoduodenostomy and hepaticogastrostomy for bile duct obstruction with duodenal obstruction. Endoscopy 2016;48:156-63. Itoi T, Itokawa F, Uraoka T, et al. Novel EUS-guided gastrojejunostomy technique using a new double-balloon enteric tube and lumen-apposing metal stent (with videos). Gastrointest Endosc 2013;78:934-9. Itoi T, Ishii K, Ikeuchi N, et al. Prospective evaluation of endoscopic ultrasonography-guided double-balloon-occluded gastrojejunostomy bypass (EPASS) for malignant gastric outlet obstruction. Gut 2016;65:193-5. Isayama H, Mukai T, Itoi T, et al. Comparison of partially covered nitinol stents with partially covered stainless stents as a historical control in a multicenter study of distal malignant biliary obstruction: The WATCH study. Gastrointest Endosc 2012;76:84-92. Itoi T, Binmoeller KF. EUS-guided choledochoduodenostomy by using a biflanged lumen-apposing metal stent. Gastrointest Endosc 2014;79:715.